Tile Refurbishing Expert, Charlotte MacIlraith. Hi! My name is Charlotte MacIlraith, and I love to clean! I have created this web site so that others may share in my knowledge and passion for cleaning. These web pages will transform the way we look at dirt and how we clean it. You too can clean your home easily and effortlessly… and have fun (Really)! You can be assured that you can keep any part of your home as clean and beautiful as the day it was installed. Really! If you enjoy a clean house but find that sometimes after you clean, certain areas they don’t look any better ~ this web site is for you. Have you ever cleaned the shower, got it wet and it started to look better? Then the water dried and it looked no better than before? Have you ever cleaned the grout on your counters or floor and no mater what you do you can’t get them clean? Sometimes you put all sorts of time into cleaning projects and you still never achieve the desired results you are looking for. But now you can! After more than two decades in the tile cleaning industry and years of experimenting with different cleaners and never finding the perfect products, I decided to create them. Thus the arrival of my new product line, Charlotte’s™ Products. 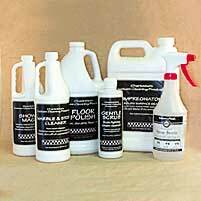 These cleaning products were developed by me using the latest technology for tile care and giving you exactly what is wanted and needed to make cleaning easy and effortless. You, too, can clean and detail your bathrooms kitchens and any area of your home, inside or out back to looking new. Once you learn how to clean these areas I will teach you how to maintain them easy and effortlessly so you can enjoy the results forever. In my professional experience most people’s new homes look good for the first year. Their tile and grout look good for maybe a year but no longer, without proper cleaning. By the second year we just get used to the idea that maybe that was the color of the grout anyway. When you look at walls in public bathrooms or restaurants they are usually a lighter color then the grout on the floor, which is usually black. My sister had a great comment one day when she said, ” I think I’d have a heart attack if I ever walked into a public bathroom and it was clean, really clean. WHY is it that certain areas such as public bathrooms that are cleaned everyday seem to only end up getting dirtier and dirtier? WHY when it is cleaned everyday? It is due to a lack of knowledge and I guarantee it’s the product. It is also important to use clean mops, towels and sponges.